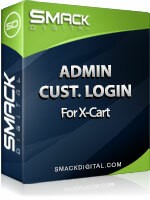 Have complete control over what links your employees have on your admin of X-cart! Control the Access to your store your employees have! Easily add links to the fulfillment staff login, giving you flexibility of what links your staff has. This module will create a new menu in the fulfillment staff area that has the additional links you set up for them. No code editing to add more links once the module is installed! Browse your admin and easily click on a link to add the current page to the Fulfillment staff view. Add 3rd party module links easily! Control the links on individual fulfillment staff users! Be sure and click on the thumbnail to see screen shots! Note that the links you can control include basic X-cart links. It doesn't store the "query" part of the URL (so specific static pages, specific products, etc). If you allow an employee a static page, you allow edits to all. If you need this please contact us for customization.